Che Vietnamese sweet and beverage dessert soup. 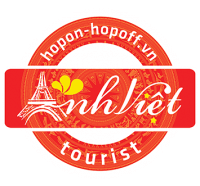 Che Vietnamese sweet and beverage dessert soup is a traditional Vietnamese sweet beverage, dessert soup or pudding. 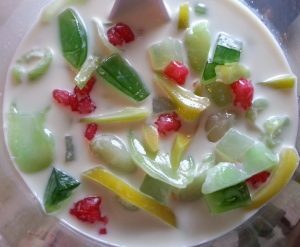 Varieties of Che are made with mung beans, black-eyed peas, kidney beans, tapioca, jelly (clear or grass), fruit (longan, mango, durian, lychee or jackfruit), and coconut cream. Other types are made with ingredients such as salt, aloe vera, seaweed, lotus seed, sesame seed, sugar palm seeds, taro, cassava and pandan leaf extract. Che are often prepared with one of a number of varieties of beans, tubers, and/or glutinous rice, cooked in water and sweetened with sugar. 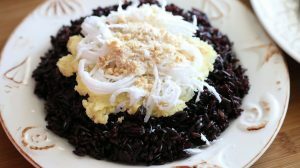 In southern Vietnam, che are often garnished with coconut creme. In northern Vietnam, che is also the word for the tea plant. Tea is also known as nuoc che in the North or more commonly tra in both regions. The Chinese category of sweet soups called tong sui are very similar to che. There is a nearly endless variety of named dishes with the prefix che, thus it is impossible to produce a complete list. therefore What follows is a list of the most typical traditional varieties of che. 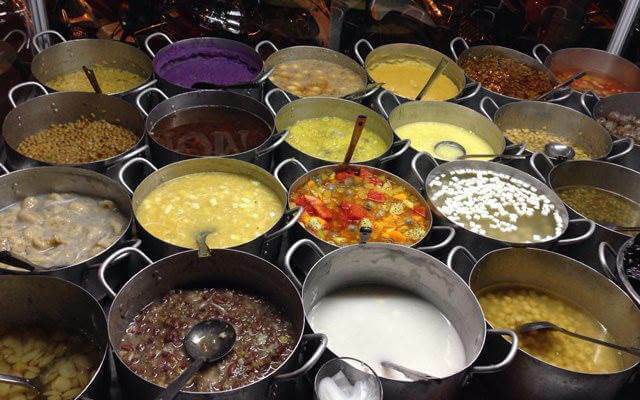 Che ba màu (literally “three colors che”) – usually including green mung beans, white black-eyed peas, and red azuki beans, although people can cook with any ingredients making any three colours they like (compare with halo halo). 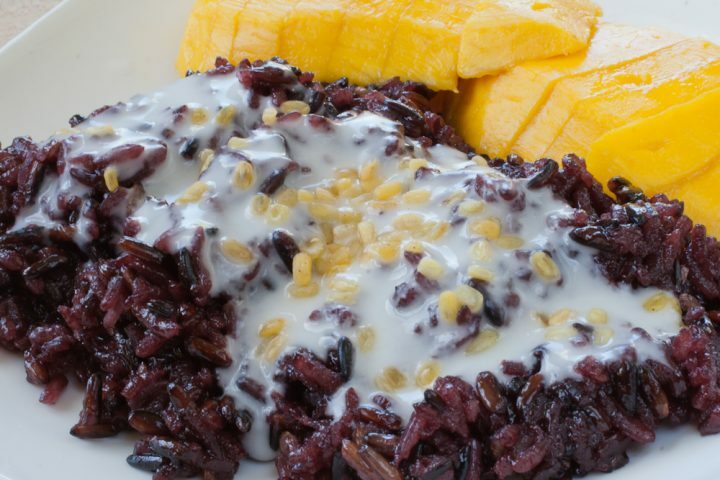 Che đậu đỏ – made from azuki beans, usually using whole beans, rarely using ground beans. Che đậu huyết – made from red beans. Che đậu trắng – made from black-eyed peas. 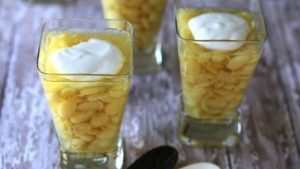 Oftentimes, this dessert is just referred to as che đậu as it is one of the most common bean dessert for southern Vietnamese. Che bánh lọt – made from bánh lọt – a cake from Huế (lọt means “to sift”). Che cốm – made from young rice. 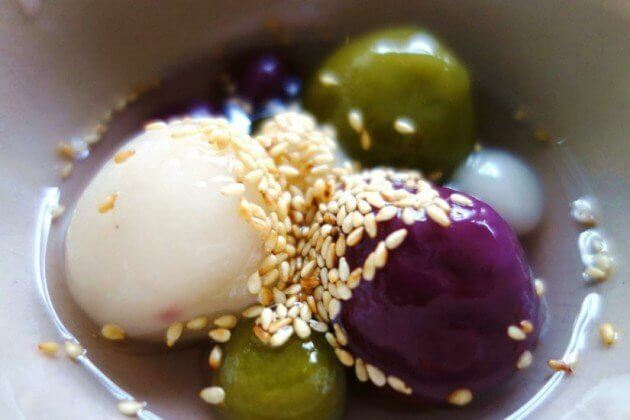 Che hột lựu (called by this name in southern Vietnam and by che hạt lựu in northern Vietnam) – in this dish, rice paste are cut into pomegranate seed-shaped pieces. Cơm rượu – mildy alcoholic chè. Che thạch lựu – made from seaweed and other pomegranate seed-shaped tapioca pearls. 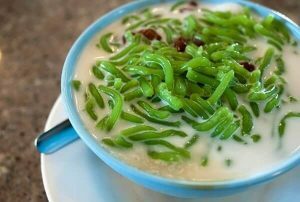 Che thạch sen – thin, vermicelli-like jellies. Che con ong (literally “bee sweet soup”; so named because this dish is viscous and yellow, like honey) – made from glutinous rice, ginger-root, honey, and molasses– this is a northern dish, usually cooked to offer to the ancestors at Tết. Che bánh xếp – green bean wrapped in a tapioca skin dumpling eaten in a coconut milk base with smaller pieces of tapioca. Translated to English, the dish is “folded cake dessert”. 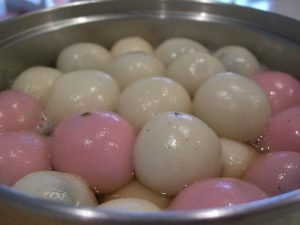 Che trôi nước – balls made from mung bean paste in a shell made of glutinous rice flour; served in a thick clear or brown liquid made of water, sugar, and grated ginger root.